The water of the Verde Valley in central Arizona, both in the ground and flowing at the surface, is a natural resource that is critical to the regional economy, environmental sustainability, and quality of life—but the Verde River faces unprecedented threats from over-allocation, development, and lack of cohesive water management. 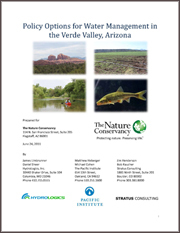 The report Policy Options for Water Management in the Verde Valley, Arizona, coauthored by Matthew Heberger and Michael Cohen of the Pacific Institute; James Limbrunner and Daniel Sheer of HydroLogics, Inc.; and Jim Henderson and Bob Raucher of Stratus Consulting, examines possible futures for the Verde River within the Verde Valley. The researchers provide information for stakeholders and decision-makers on the river’s resources, economic value, and tools for promoting sustainable water management. Included are three detailed case studies examining how others in the western United States have begun reforming groundwater management to maintain river flows. The authors analyze water management in the Middle Rio Grande Basin in New Mexico, the Deschutes River Basin in Oregon, and the Edwards Aquifer in south central Texas. In many areas of the United States, excessive pumping and groundwater overdraft are causing rivers and wetlands to go dry. In western states, where most surface water has long been fully appropriated, growing populations have turned increasingly to groundwater, leading to decreases in stream flow, conflicts with surface water rights, and harm to fish and wildlife. States have begun the process of reforming outdated laws and policies, some more ambitiously than others, and with mixed results. already been observed, and further reductions could have harmful side effects on the region’s economy and could lead to federal intervention in local water management to maintain habitat for endangered species.